Place the crab meat in a large mixing bowl and carefully pick through for shells, then set aside. Melt the butter in a medium skillet over medium heat. Add the onion, poblano, garlic, salt, chile powder, black pepper, and cayenne and cook, stirring, until the vegetables are softened but not brown, 3 to 4 minutes. Transfer the vegetable mixture to a mixing bowl and set aside to cool for about 15 minutes. Add the crab, the egg, mayonnaise, mustard, hot sauce, scallion, parsley, lemon juice, and ¼ cup of the bread crumbs to the vegetable mixture. Using your hands, gently combine the ingredients. Using a 1-cup measuring cup, form the mixture into cakes, packing gently; they should look like hockey pucks, about 2 inches thick with straight sides. Cover the cakes and chill for 20 to 30 minutes, or overnight. 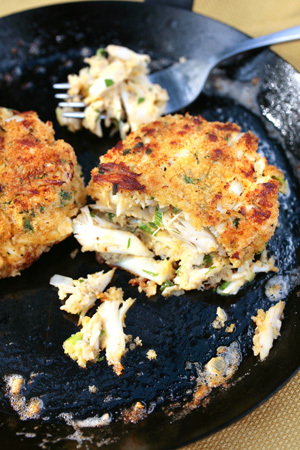 When you are ready to cook the crab cakes, place the remaining ½ cup bread crumbs in a pie tin. Dredge both sides of each cake in the crumbs, shaking off the excess. Heat 2 tablespoons of vegetable oil in a large skillet over medium-high heat. When the oil is hot but not smoking, fry the crab cakes for 4 to 5 minutes on each side, until golden brown. Do not overcrowd the pan-fry in batches if necessary, adding more oil if needed. Serve immediately, with Jalapeño Remoulade. For the best results, make this spicy condiment a few hours in advance and then cover and refrigerate, so the flavors have time to develop. Whisk together all the ingredients in a mixing bowl; cover and refrigerate until needed.